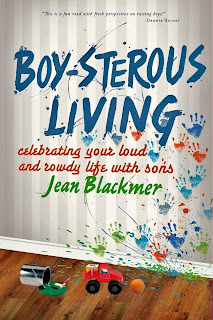 Welcome to Married Life: Book: Boy-sterous Living *and Giveaway! Today I'd like to introduce you to a book that will most likely be a lifeline for me in the years ahead! I haven't had a chance to read it yet, but I'm not giving my copy away! If you'd like to win a copy of this book please leave me a comment about your boy(s)! I will pick a winner next Monday (the 28th). I love being a mama to boys! I would love have a few more...we'll see what God decides on that. I keep meaning to get a copy of "Bringing Up Boys" by James Dobson but this book sounds like a valuable resource as well! When I was pregnant with my son, I regularly prayed that he would be the kind of boy that "had to be hosed off at the back door on a regular basis". God answered that prayer and then some. While he is a great joy, he is a daily challenge! I'll take any input I can get and this book sounds like it would be great. Thanks! I don't have a boy, obviously, but I have watched my nephew and thank God daily that he gave me a quiet, studious girl! I know I would not be able to handle the chaos my sister goes through. I got those ones in Oregon ;) LOL..so that wouldn't help! Sacha and his daddy went to Dairy Queen for a treat. Sacha ordered fries and a dilly bar. Tony ordered a combo of some kind. Sacha noticed that Tony's fries box was larger than his. Why yours fries bigger than mine? Daddy: Because I am a daddy and I have bigger fries than little boys. Sacha: Is everything bigger when you a daddy? Daddy (trying not to laugh): Yes, Sacha. I love boys. I love being a mom of boys. Once in awhile I feel a little put out watching friends that have quiet little girls that stay where you put them and talk back instead of smack siblings over the head with dinosaurs, but then I remember how much more excitement I have, how fun it is, how many more stories I have to share. Who would want to miss all that? Of course when you walk in and find your son painting the toilet seat and parts of his person with materials scooped out of the toilet things do get a little dicey. But all in all boys are wondrous and God knew what he was doing when he blessed me with little ones of the fiercer gender. Pick me, seriously. All of our adventures aside...I really need that book!!! Thanks for teh book review and I love seeing the comments about boys from other moms!